Shotpouch Creek has some of the highest potential for restoring aquatic habitat in the Marys River Watershed (see http://www.mrwc.org/?p=36). In 2010, the Council met with Shotpouch Creek landowners to gauge the interest in pursuing a neighborhood restoration effort. As of 2014, fifteen landowners have partnered with the Council to implement restoration projects on their lands along Shotpouch Creek. Fish Friendly Crossings: Seven culverts were replaced on Shotpouch Creek and its tributaries to assure that fish, lamprey and other aquatic life would have year-round passage to access spawning or rearing habitat upstream. 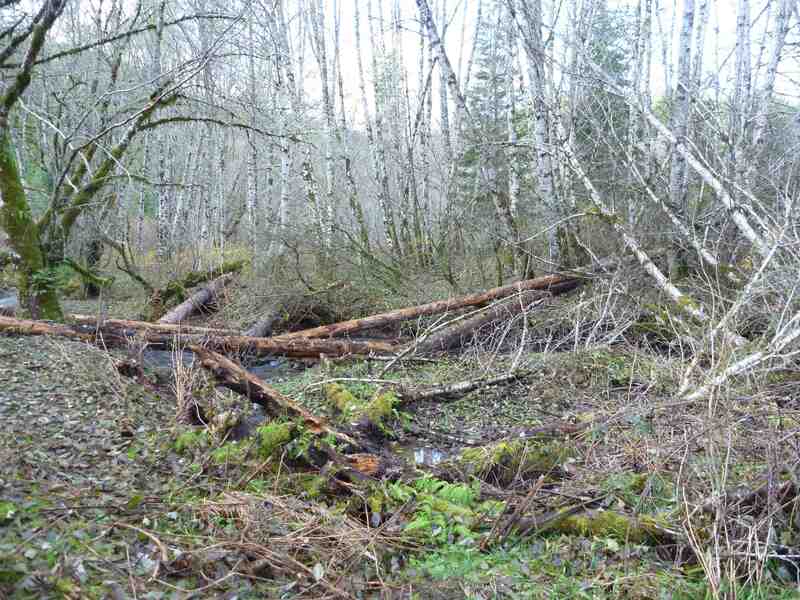 Large Wood Placement: With the participation of nine landowners, Shotpouch Creek was enriched with large wood to trap gravels and increase the complexity of the stream channel and its interaction with the floodplain during normal winter flows. Thirty-one large wood placements, each made up of two to ten 60 foot long Douglas fir logs, were placed along 4.2 miles of stream. An additional 5.5 miles of middle and upper Shotpouch Creek would benefit from similar large wood treatments in the future. 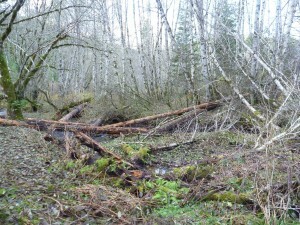 Some of the logs are expected to provide additional winter stability to beaver dams. Beaver are a key contributor to maintaining stream habitat for fish, birds and other wildlife on Shotpouch Creek. 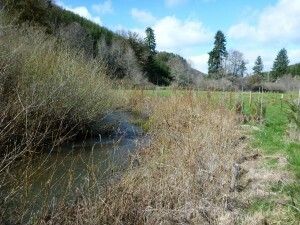 Beaver ponds significantly increase the available summer and winter rearing habitat for cutthroat trout and steelhead. Riparian Planting & Livestock Fencing: As of early 2015, fourteen landowners will have partnered with the Council to plant 39 acres along 2.75 miles of Shotpouch Creek along with 3.3 miles of livestock exclusion fencing. 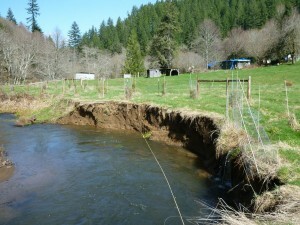 Much of the banks of lower Shotpouch Cr had displayed the effects of riparian grazing, with steep failing banks. Annual maintenance of the plantings for 3-5 years will assure its successful establishment. Off-Channel Alcoves: Two landowners worked with the Council to develop off-channel alcoves on their land that will provide slack-water habitat during high winter flows. Bank Stabilization: Three sections of stream bank were pulled back to a 10:1 slope and planted with willow to arrest excessive erosion that was of concern to two landowners. This project was supported by funds from Oregon Watershed Enhancement Board, Oregon Dept of Fish & Wildlife, National Fish and Wildlife Foundation, USFWS Finley Wildlife Refuge and Meyer Memorial Trust.